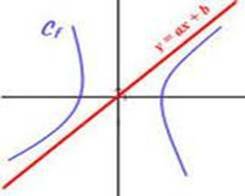 An asymptote for a function f(x) is a straight line which is approached but never reached by f(x). These are the vertical lines near which the function f(x) becomes infinite. If the denominator of a rational function has factors of the type (x - a) in the numerator, then the rational function will have a vertical asymptote at x = a for each (x-a). A horizontal asymptote is a line y = a, such that the values of f(x) get increasingly close to the number a as x gets large in either the positive or negative direction. Rational functions have horizontal asymptotes when the degree of the numerator is the same as the degree of the denominator. An oblique asymptote is an asymptote of the form y = ax + b with ‘a’ being non-zero. Rational functions have oblique asymptotes if the degree of the numerator is one more than the degree of the denominator. Use quotients of polynomials to describe the graphs of rational functions. To draw the graph of a rational function, we must find the asymptotes, the intercepts and a few points and then plot them on the graph. Once you get known to the things, rational functions are actually very easy to graph. Find the horizontal and vertical asymptotes of the rational function in question 15 above. 1. 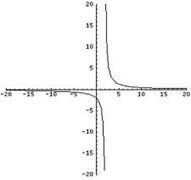 The vertical asymptote occurs where the denominator is zero, i.e. at x = -5.